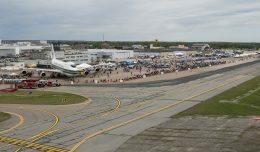 2015’s Rhode Island Air Show marked the end of the show season for New England as well as the 25th anniversary of hosting air shows at Quonset Point. 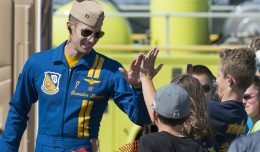 Organizers marked the silver anniversary in style with one of the best performer lineups in recent memory leading up to the headlining US Navy Blue Angels. To say the Rhode Island Air Show merely had a good lineup would be a gross understatement. Air show fans, enthusiasts, and friends or family who were dragged along were treated to three jet teams in addition to multiple tactical demonstrations; some of the best aerobatic performers in the world; warbirds; a 1920s era biplane with a jet strapped to it; and a tractor trailer that thinks it’s the three-way offspring of a top fuel dragster, an F-15 and a DC-10! In addition to the Blue Angels, the Royal Canadian Air Force supported the show with the Snowbirds and the beautifully painted CF-18 Demo Team. 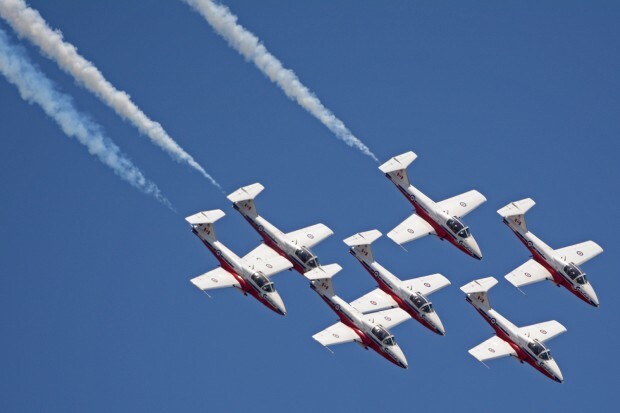 The Snowbirds flew their trademarked nine-ship CT-114 Tutor demonstration with an impressive array of formations. 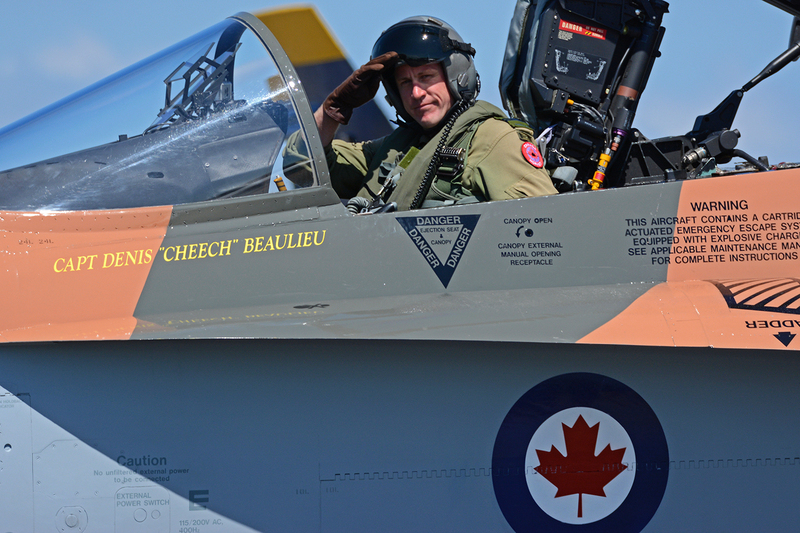 Captain Denis “Cheech” Beaulieu flew the camouflage topped CF-18 like he stole it, with enough afterburner and vapor to please any aviation enthusiast. 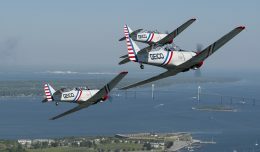 As part of its inaugural North American tour, the Breitling Jet Team made the hop from Jones Beach to Quonset Point to perform its aerial ballet in their L-39s. The Breitling team did a great job of keeping aircraft on the showline for nearly the entire performance, and the final pass was made extra special by not only popping flares, but by thanking America for coming to the aid of the French during WWII. Air Combat Command increased support of air shows this year, and sent the newly reestablished Viper Demo Team’s F-16s up to add a bit more jet noise to an already turbine-heavy lineup. 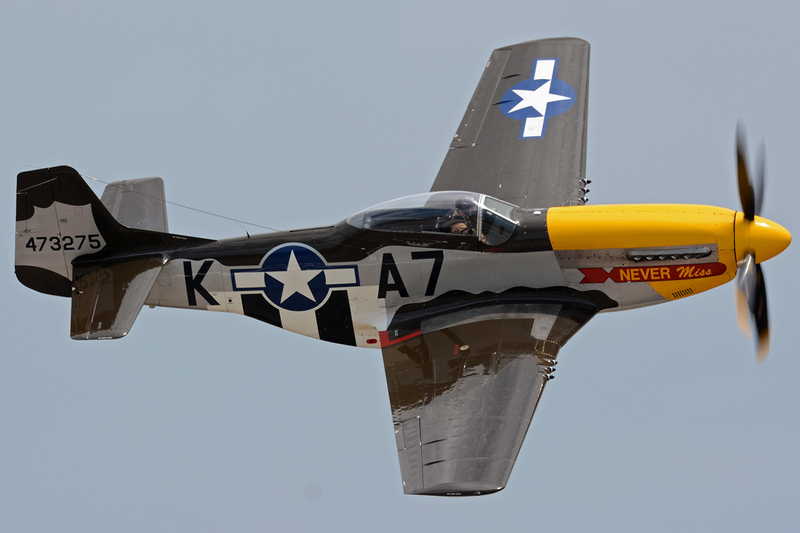 Following his demonstration, “Rocket” joined up with Jim Beasley in the P-51 Bald Eagle for a heritage flight. Rob Holland, Sean Tucker and John Klatt provided the aerobatic demonstrations for the show. Each flew in his trademarked high energy styles with enough tumbles, spins, rolls and loops to capture the attention of everyone attending. Their incredible displays of precise piloting really helped strengthen the lineup, and showcased the strengths of the most advanced aerobatic planes built to date. The classic touch of the show was provided in the form of Greg Colyer’s T-33 Ace Maker, Dave Murphy in the P-51 Never Miss and the Geico Skytyper’s SNJs. “Wired” did an outstanding job showcasing the T-33 with series of graceful aerobatic passes being bookended by the tightest photo passes of the show. The P-51 demo helped to add historical context to the anniversary of the Battle of Britain, which was being celebrated by the Canadian and French participants. The Skytyper’s SNJs provided the requisite round engine noise to the air shows, as the unmistakable sound of prop tips going supersonic filled the airshow grounds during their new smoke filled tactical-style formation demonstration. Perhaps the most unique act to take to the skies over Quonset Point was the Jack Links Screamin’ Sasquatch. Built off a 1920’s era Taperwing Waco, Screamin Sasquatch has a bit of extra power in the form of a turbine engine mounted under the nose. No matter how many times you see it fly, there is always something odd about hearing the roar of a jet, the growl of a radial, and seeing an open cockpit biplane all at the same time. Pilot Jeff Boerboon puts the aircraft through its paces using its combination of engines to demonstrate the performance on the radial and with the jet switched on. The flights ended with a race against the triple engine Shockwave jet truck which filled the flightline with smoke, fire and kids running to the fence to get a glimpse at the world’s fastest big rig. 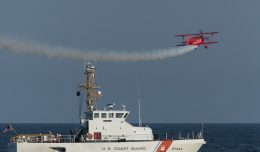 No airshow would be complete without a glimpse of the hometown unit, and the Rhode Island Army National Guard and Air National Guard did not disappoint. 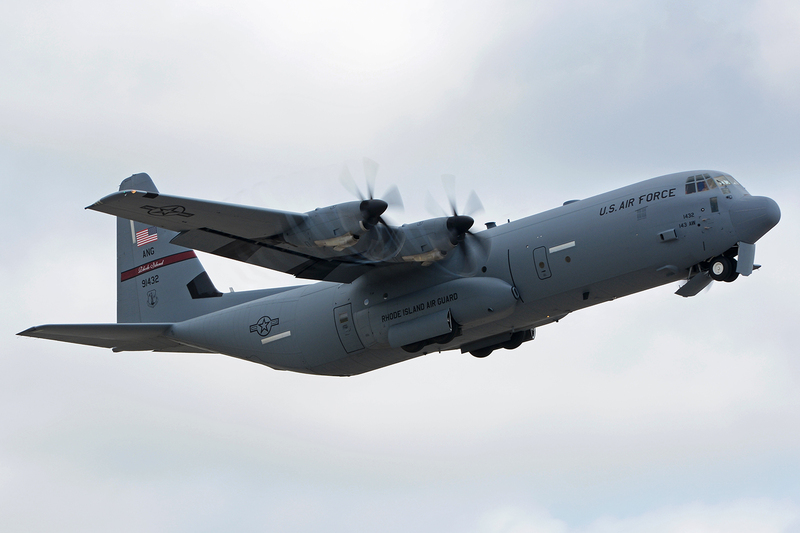 The show was opened by a pair of C-130J’s from the 143rd Airlift Wing that made two formation passes each day before breaking off to land. Following the C-130 recovery, four MH-60s took to the skies for a combined arms demo. The first two Blackhawks dropped off slingloaded Humvees, then broke off into top cover while the second element dropped troops to begin maneuvers using the vehicles. Saturday’s show was one of the most well attended air shows I can recall, with crowds estimated well north of 100,000 filing in to enjoy the near perfect weather. With clear skies, highs in the mid 70s and a cool breeze to keep the sun at bay, people braved the traffic and traveled from far and wide to turn their eyes to the skies to watch the pilots perform. As is the case with any air show, it pays to arrive early, as many people were stuck in traffic for hours trying to get on base. Staying late has its benefits as well, and it seemed that the lines kept moving quite well once you got to the main roads with extra lanes being used to expedite the flow of traffic away from the airport. Sunday’s show saw far lower attendance due largely to a less than favorable forecast earlier in the week. In the end, the weather did cooperate for the most part, with all the acts being able to fly, though the Blues were forced to fly a low show. The air show weather gods were smiling and laughing at those of us watching, with the rain holding off until about a half hour after the Blue Angels secured their jets. A few strong isolated cells blew through about an hour after flying ended for the day, forcing the performers and ground crews to scramble to get all of the aircraft safely hangared and properly secured. From a photographer’s perspective, Quonset is one of the best shows I have shot as far as light goes. While the morning acts are a bit backlit towards the south end of the show box, the sun swings around behind the crowd as the day progresses, providing incredible top and side light that is perfect for photographs. In addition, all the performing aircraft taxi directly in front of the crowd providing outstanding ground shot opportunities and a chance to perfect one’s prop-blurring skills. The gorgeous light combined with this year’s outstanding lineup was the perfect formula for plenty of full memory cards and great photos.